Apsley is a rural village on the Wimmera Highway, 10 km east of the South Australian border. Despite its remoteness from Melbourne Apsley was defined as a postal town in 1848, only three years after the district was first occupied for pastoral runs. It lay at the junction of two roads to Adelaide, one from Casterton and the other from Cavendish. Apsley was first known as Lake Wallace, the name of a pastoral run (1845), 20 km south-east of Edenhope. 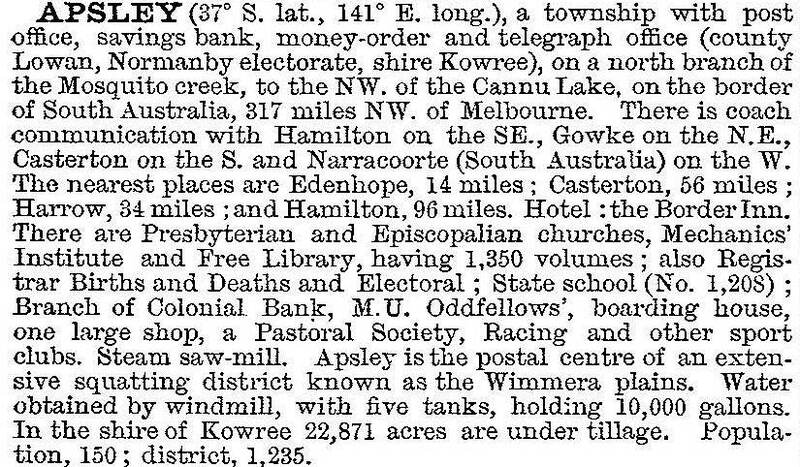 In 1851 the Lake Wallace postal town was surveyed for the sale of allotments and renamed Apsley, probably inspired by Apsley, Tasmania. The Border Inn and a store were opened, and were patronised by travellers to the Victorian gold fields. A racing club was established in 1855 and reputedly hosted the poet/rider Adam Lindsay Gordon, and a customs house was erected for trade between the two colonies. An agricultural and pastoral society was established in 1861. In 1870 the Apsley Common School was opened. Apsley’s population and rural activity remained comparatively unchanged until after World War II when part of the Newlands and all of the Benayeo pastoral properties were subdivided for soldier settlement. The school was rebuilt in 1964 on a new site, described as bracken-infested. Working bees cleared the land and planted a pine-tree windbreak. Apsley has a school (12 pupils, 2014), the Border Inn hotel, a store, a war-memorial hall, a golf course, a recreation reserve, and Catholic and Uniting churches. In 2000 a history walk with illustration panels was constructed. The racecourse was closed in 1975 and meetings transferred to Edenhope. The local football team became ‘Edenhope/Apsley’ in 1998. At the 2011 census, farming accounted for 32.5% of employment.